IL VILLINO E LE SCUDERIE is a property located in the heart of the famous Chianti wine-region. Our country-estate commands a breathtaking view from the hillsides of the village of Lamole, just 35 km away from Florence and Siena. The two villas in the estate, Il Villino e Le Scuderie, are surrounded by an enormous private park with gardens, vineyards and fruit orchards for a total of 1,5 hectares. A private swimming-pool (6x12 meters large) overlooks the valley of the Greve river. The perfect place to be in terms of location and key departure point for day trips. IL VILLINO E LE SCUDERIE (max 15 pax) CAN BE RENTED TOGETHER OR SEPARATELY: IF YOU WISH TO BOOK ONLY IL VILLINO (6/8 guests) OR ONLY LE SCUDERIE (9 guests) WE WILL SEND YOU A CUSTOM OFFER UPON REQUEST. IL VILLINO IS AVAILABLE ONLY FROM MAY TO OCTOBER. In case you rent just one villa the pool will be shared with possible guests in the other villa. IL VILLINO: It is a villa on 2 levels, it sleeps up to 6 persons in 3 double bedrooms. For groups of 8 persons, we may offer a 4th bedroom with 2 single beds. GROUND FLOOR: living-area with a fireplace dated 1894, a kitchen (fully equipped with fridge, freezer, cooker, oven, microwave, dishwasher and washing machine), breakfast-room, large living room with Sat-TV and Stereo-Cd player, 1 bathroom and a large dining room. UPPER FLOOR: 3 double bedrooms, 1 double bedroom available on request and 3 bathrooms. FACILITIES: Internet Wi-Fi. Swimming pool. Private outside space in our park equipped with tables and chairs in order to eat or relax open air. Barbecue. IL VILLINO has not heating system, therefore is available only from May to October. LE SCUDERIE: It's a villa on 2 levels and accommodates up to 9 persons. GROUND FLOOR: living room with fireplace, kitchen (fully equipped with fridge, freezer, cooker, oven, microwave, dishwasher), dining room with terrace, 2 bathrooms, a double bedroom, a twin bedroom. UPPER FLOOR: living room with fireplace, kitchen (fully equipped with fridge, freezer, cooker, oven, microwave, dishwasher and microwave), 2 double bedrooms, 1 single bedroom, 3 bathrooms. FACILITIES: Internet Wi-Fi, Satellite TV. Stereo/Cd player. Private heating. Swimming pool. Private outside space in our park equipped with tables and chairs in order to eat or relax open air. Barbecue. Laundry room with washing machine. On the ground floor, from a large stone patio you enter a huge living room with an impressive fireplace dated back in the XVIII Century. Then you have a bedroom with 2 single beds and a bathroom with a changing room. There is also a large double bedroom decorated with an amusing trompe l’oeil and a second bathroom with a changing room. The cozy kitchen, leading out to the patio and has a wood-burning oven built with the house. From a panoramic terrace you access the upper floor which opens up to a lovely living room with an old stone fireplace and a small kitchen. On this floor there are also three bedrooms: the pink room with a romantic double bed, the yellow room with a double antique bed and the green room with a single bed. Each bedroom has its own bathroom with shower, and one has a full size bathtub. PLEASE NOTE THAT THERE IS A MINIMUM STAY OF 7 NIGHTS IN VERY HIGH SEASON AND THAT THE WEEKLY PRICE MAY VARY ACCORDING TO THE PERIOD. THE PRICES REFER TO IL VILLINO AND LE SCUDERIE FOR GROUPS OF MAX 15 PERSONS. IF YOU WISH TO BOOK ONLY IL VILLINO (6/8 guests) OR ONLY LE SCUDERIE (9 guests) WE WILL SEND YOU A CUSTOM OFFER UPON REQUEST. IL VILLINO IS AVAILABLE ONLY FROM MAY TO OCTOBER. The use of heating in winter at Le Scuderie is extra and is charged according to consumption. Lamole is my life, it is the house where I was born and raised. My family still meets at "Il Villino & Le Scuderie" during the summer to spend time together, because the atmosphere is really magical there and nature is untouched. Organize delicious dinners for children and grandchildren in my garden is for me one of the most enjoyable times of the year. The passion for walking involves the whole family. Looking for mushrooms and wild strawberries and watching the wildlife of the place is priceless! 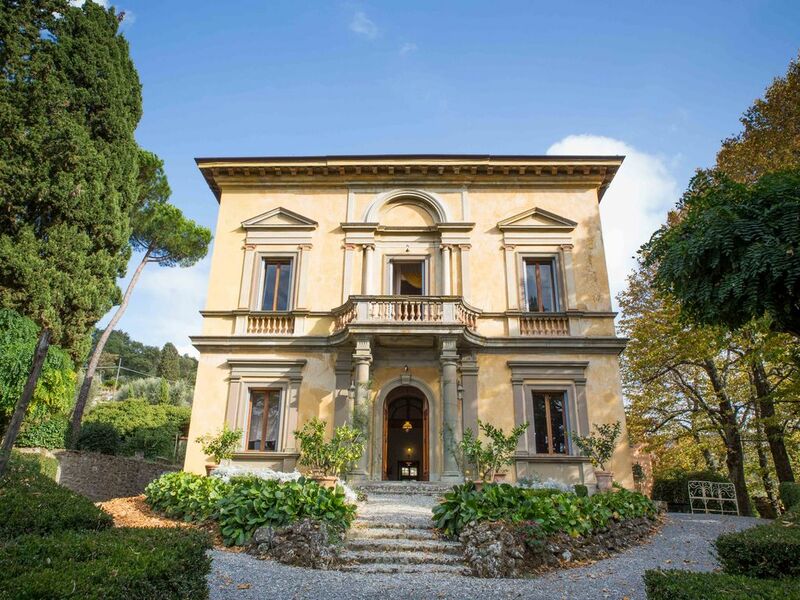 IL VILLINO E LE SCUDERIE is a 19th century Tuscan villa located in the heart of the famous Chianti wine-region, our country-estate commands a breathtaking view from the hillsides of the village of Lamole. This villa has been owned and lovingly cared for by the Socci family from five generations. A recent restoration has revealed hidden treasures, such as decorative frescoes and original structures. Full relax, far from the city noise, surrounded by nature. My villa is especially appreciate in the summer, because due to its particular position, it is very fresh and you do not need the air conditioning. The main touristic sites/cities are at reach, so you may enjoy daily trips to see & taste our culture and to then go back to the property to enjoy a cooling dip in our swimming-pool that overlooks the Chianti hills. We had a blast staying this rustic tuscany villa. the restaurant next door was great too. Ciao! It has been a pleasure having Tony and his family as guests. They are a delightful family and treated our property as their own. We hope to see them back in the future. Lamole is a small medieval village located in the rolling hillside of the Chianti wine region about half-way between Florence and Siena (30 Km away from both) . The panorama is immense and unique. Making their way up the hillside along the narrow road lined by cypress trees, important historical villas can be found, designed by such famous architects as Leonardo Da Vinci and Michelangelo. Our ownership is the best starting point to visit the vineyards of the reknown Sangiovese wine, key to the local production of Lamole’s Chianti Classico D.O.C.G., and to discover Tuscany! From May to October it is possible to rent IL VILLINO e LE SCUDERIE separately, for prices information please contact us. During the winter only Le Scuderie are available due to heating which is to be paid according to consumption.The minimum stay and the prices can vary in according of the period of the year and number of guests. The security deposit is required. LOCAL TAX: Please note that the City of Greve in Chianti requires a tax of Euro 1,50 per person per night for a maximum of 7 nights which is not included in the rental cost (except children up to 14 years).